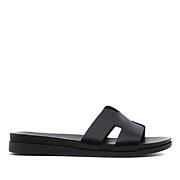 The first step in improving your foot health is to invest in quality, high-fashion footwear like these slip-on leather sandals from Steve Madden. As part of his Natural Comfort line, they feature a sturdy platform wedge and chic crisscrossing straps to add serious style to the seriously comfortable design. I feel they were constructed specifically for me,His shoes are A God Sent!Thank You, Steven! These sandals are very lightwith a little lift & the leatherIs so soft. I highly recommendthem! I love my sandals. They are sooo cute and comfortable. 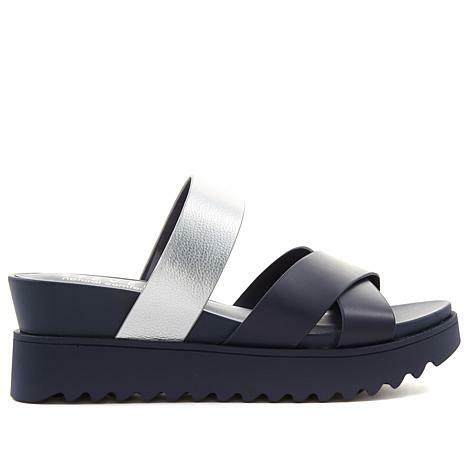 I love a good navy blue sandal and these fit the bill. I like that they have a platform heal without feeling too high. The slight wedge is just right. I cannot say enough about how comfortable they are. I paid full price for my sandals although they are now on clearance. I may get the black pair. Thanks, Steve Madden and HSN for offering these in navy blue (so hard to find)!